Bundesliga | Copa America Centenario | Bundesliga-infused Chile too hot for Argentina at the Copa America? Bundesliga-infused Chile too hot for Argentina at the Copa America? "The Chilean players make the Bundesliga an even stronger and more attractive league," says Bayer 04 Leverkusen sporting director Rudi Völler, who has Charles Aranguiz - the man who helped fire Chile past Colombia in the semi-finals - in his ranks at the BayArena. "At the same time, those [Chile] players benefit from the Bundesliga." Chilean players in Germany have indeed come a long way since centre-back Waldo Ponce played five league games on loan at VfL Wolfsburg in the 2003/04 season before returning to Club Universidad de Chile the following summer. TSG 1899 Hoffenheim's Eduardo Vargas helped the Sinsheim club complete the great escape under Julian Nagelsmann in 2015/16, and whilst he was used in fits and spurts last term, his two goals and three assists in 16 starts was a respectable return given he was used on the right-hand side of midfield for much of the campaign. Freed of relegation dogfights and positional constraints with his national team, Vargas has proven a deadly striker for Chile when employed at the centre of a front three. The top scorer with four goals as Chile romped to the Copa America title on home turf last year, Vargas has silenced any suggestions that such a return may have been a fluke with a six-goal haul ahead of Sunday's rematch of the 2015 final. Apart from current international teammate Alexis Sanchez, only late-1990s and early-2000s goal demons Marcelo Salas and Ivan Zamorano have scored more for their country, and Arsenal FC stand-out Alexis has had 41 more caps to bag only three more goals than Vargas. Behind Vargas, there are few better central midfield combinations in world football than Aranguiz and FC Bayern München's all-action star Arturo Vidal. Vidal was the heartbeat of the Bayern side that sealed a record fourth consecutive Bundesliga title, and though he had won Italian Serie A titles with Juventus FC for each of the previous four campaigns, the now 29-year-old really came to prominence when he swapped Club Social y Deportivo Colo-Colo for Völler's Leverkusen in the summer of 2007. "We noticed how talented Chile players were just in time when we contracted Vidal in 2007," said Völler, who personally travelled to South America to secure the then 20-year-old's signature. A versatile defensive player early in his career, Vidal became a feared box-to-box midfielder in his four-year stint with Die Werkself. "[Chilean players] have more versatility on the pitch. Their time in Germany has been a key step in their development to play with the aggressiveness they show. 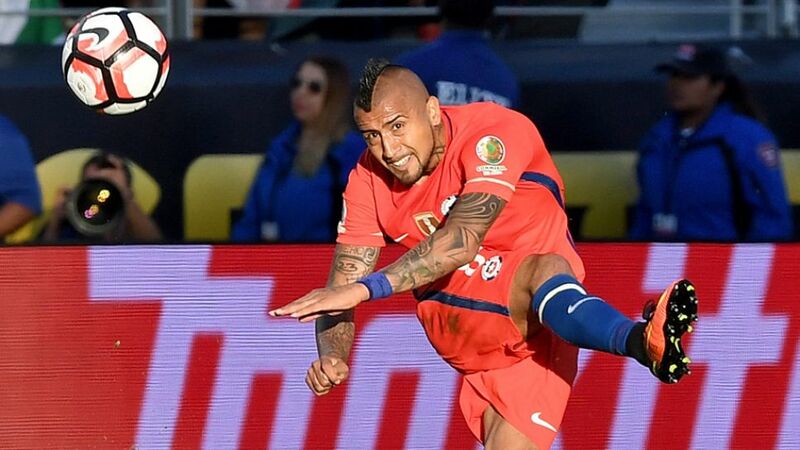 Chile have a very aggressive style that is recognised throughout the world." Now the complete midfielder, 'King Arturo' completed an impressive 90 percent of his passes as Bayern wrapped up a Bundesliga and DFB Cup double in 2015/16. Vidal proved beyond doubt that he was the man for the big occasion in last year's Copa America final, too, scoring the winning penalty in the shoot-out after a goalless draw in Santiago to cap off a man-of-the-match performance. Vidal scored both goals in this summer's 2-0 win over Bolivia in Group D, and it speaks to his importance to the team that he is simultaneously able to take the goal burden off Vargas whilst being seen as the player most likely to stop five-time FIFA Ballon d'Or winner Messi. Chile invariably employ a 4-3-3 formation under coach Juan Antonio Pizzi, with Aranguiz slotting in beside Vidal and former Hamburger SV midfielder Marcelo Diaz. Aranguiz played all six games in Chile's run to the title last year, but his subsequent transfer to Leverkusen from Sport Club Internacional de Porto Alegre was derailed by a torn Achilles tendon. He finally made his Bundesliga debut in April, and chipped in with a goal and two assists as Leverkusen secured automatic UEFA Champions League football with a third-place finish. "Aranguiz is a great player who is fast, technical and has endurance," continued Völler. "Charles is very versatile. Here at Leverkusen, we brought him in to play as a defensive midfielder and now in the United States he is showing his talent by executing [good] passes and he has been very precise with his tactics. His sharp play has resulted in goals. We are very happy that he is with us, he is a distinguished player." Of the current Chile squad, the presence of centre-back Gonzalo Jara and striker Nicolas Castillo - both of whom turned out for 1. FSV Mainz 05 - means La Roja have no fewer than six players who have cut their teeth in the Bundesliga. "They have shown that they can play in any league in the world and that they can perform in the Bundesliga, which is among the top three leagues in the world," said Völler. "If they continue like this, they are the clear favourites to win the Copa America Centenario." Messi might be the star attraction at the MetLife Stadium in New Jersey on Sunday, but defending champions Chile - brewed in South America and distilled in Germany - could well be the ones toasting success once the full-time whistle is blown.